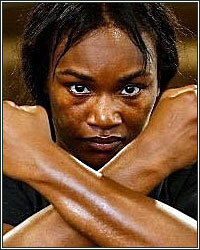 Claressa Shields is the undisputed middleweight champion of the world. The 24-year-old Flint, Mich. native delivered the best performance of her career and cruised to a unanimous decision over Germany’s Christina Hammer Saturday on SHOWTIME in arguably the most significant women’s boxing match in history. The judges scored the fight 98-92 and 98-91 twice. The two-time Olympic gold-medalist Shields (9-0, 2 KOs), who entered the fight holding the IBF, WBA and WBC 160-pound titles, showed off her complete arsenal of skills in the dominating performance and now joins Terrence Crawford, Jermain Taylor, Bernard Hopkins, Oleksandr Usyk and women’s welterweight Cecilia Braekhus as the only fighters to have unified all four major world titles in any weight class. Christina Hammer (24-0, 11 KOs), who owned the WBO belt entering the fight, had her jab largely neutralized and her defense exploited from start to finish. Shields landed a remarkable 44% of her power punches and landed on 112 total punches compared to just 49 for Hammer. As impressive as her offense was, Shields’ defense and head movement was immaculate as Hammer was able to connect on just 13% of her total punches, 11% of her jabs and 18% of her power shots. Speaking to SHOWTIME’s Hall of Fame analyst Steve Farhood following the historic night for women’s boxing, the outspoken and emotional Shields held nothing back. “I am the greatest woman of all time,” said Shields, who nearly earned a stoppage during a barrage in the closing moments of the eighth round. “I did it. She didn’t win a single round. I almost knocked her out. I swear I feel like I’m dreaming right now. Thanks to Christina Hammer and her team. They said she had a hard jab and they weren’t lying. Her jab is off the chain. Fresh off the biggest win of her professional career, the newly-crowned undisputed champion of the world already has her sights set on another opponent. “I didn’t fight very good or fast,” said a subdued Hammer. “That’s boxing, anything can happen. I wanted this fight. She won, respect to her. She’s a tough, strong woman and that’s all I can say. "I think tonight's fight will go down in the history books as an epic battle with the likes of Ali-Frazier, Leonard-Hearns and De La Hoya-Trinidad," said Dmitriy Salita, President of Salita Promotions. "With this dominating and captivating performance to become crowned undisputed middleweight champion coupled with her list of record-breaking accomplishments, Claressa Shields is well on her way to being as revered as Muhammad Ali, Sugar Ray Robinson, Serena WIlliams, Michael Jordan, Pele and others at the top of their game." In the co-featured bout, Jermaine Franklin (18-0, 13 KOs), widely regarded as the top American heavyweight prospect, kept his unbeaten record intact with a 10-round unanimous decision over former No. 1-ranked U.S. amateur Rydell Booker (25-2, 12 KOs). The judges scored the fight 99-91 and 98-91 twice. The 25-year-old Franklin dictated the tempo throughout and was far more active and aggressive than his 38-year-old counterpart. Booker had his moments, particularly in the early rounds when he landed several flush power shots but the youthful Franklin pulled away in the second half of the fight as Booker tired and Franklin targeted the body. Franklin averaged 54 punches per round to Booker’s 35 and led 146-94 in overall punches landed. “I think I had a decent performance,” said the Saginaw, Mich. native. “There’s some stuff I could work on. I over-crowded myself a little bit and I was a little over-anxious. He had a lot more experience than me and used it to his advantage. He could see what I was doing. “I felt he out-hustled me, but it was a lot closer than how the judges scored it,” said Booker. “He was missing me a lot more than it looked. I slipped a lot of shots and hit him clean. In the telecast opener, undefeated top-five ranked heavyweight prospect Otto Wallin (20-0, 13 KOs, 1 ND) and Baltimore’s Nick Kisner (21-4-1, 6 KOs, 1 ND) had their 10-round bout cut short when the two heavyweights clashed heads in the opening round. Wallin suffered a gash on the side of his head while Kisner suffered a cut over his right eye, hindering his ability to see. At the advice of the ringside physician in between rounds one and two, referee Earl Brown stopped the fight, resulting in a no-decision. At the time of the stoppage, Wallin led 14-3 in overall punches landed, 7-1 in jabs and 7-2 in power punches. “To me, his cut didn’t look that bad,” said a disappointed Wallin, who was making his U.S. debut. “It’s a shame because I trained really hard for this fight and was looking to put on a show for fans in America. I just didn’t have time to get going. Tonight’s live event was promoted by Salita Promotions. An encore presentation of tonight’s tripleheader will air Monday at 10 p.m. ET/PT on SHOWTIME EXTREME and will be available via the network’s On Demand platforms. Hall of Famer Barry Tompkins called the action alongside fellow Hall of Fame analyst Steve Farhood and former world champion Raul Marquez. World-renowned ring announcer and Hall of Famer Jimmy Lennon Jr. rounded out the telecast. The Executive Producer of SHOWTIME BOXING: SPECIAL EDITION was Gordon Hall with Richard Gaughan producing and Rick Phillips directing. Shields vs. Hammer will pit undefeated middleweight world champions Claressa Shields and Christina Hammer against each other in a battle to crown the undisputed 160-pound world champion, in what is arguably the most significant women’s boxing event in history. The co-feature will pit Jermaine Franklin taking on Rydell Booker in a thrilling 10-round heavyweight bout and in the telecast opener, heavyweights Otto Wallin and Nick Kisner will battle in 10-round clash. The SHOWTIME BOXING: SPECIAL EDITION tripleheader will air live on SHOWTIME at 9 p.m. ET/PT from Boardwalk Hall in Atlantic City, N.J.
REGIS PROGRAIS GOES ALL IN ON KIRYL RELIKH SHOWDOWN; WARNS HE MIGHT MAKE IT "A REAL BLOODY FIGHT"
[VIDEO] HASIM RAHMAN GOES ALL IN ON JARRELL MILLER FAILED DRUG TESTS; INSISTS OTHER USING "THE ARMSTRONG"
[VIDEO] GOLOVKIN NOT RULING OUT LIGHT HEAVYWEIGHT FIGHT IF THE OPPONENT IS RIGHT AND PROPOSAL IS "REALLY GOOD"